The first cylinder block was on display at both the MAFCA convention in Canada and at the Apple Hill event. As a result, several new people have been added to the update (progress report) list. I simply added these people to the Email list and never sent the July 2010 update to them. In order to bring these new people up to date, I will re-send the July 2010 update to all in a few days. If you’ve already seen it, please just ignore it. I have received several inquiries about schedule and cost. This new engine project is a one man effort by someone who has a lot of other irons in the fire. Last year at this time, I had just completed the cylinder block patterns and was starting on core boxes. I have committed to give a seminar at next years MARC convention in San Diego, and my goal is to have an engine by then. As far as cost, when I looked into the feasibility of building an improved Model A engine (2008), the cost had to be minimal and in the ballpark of $3000. Cost has been a major factor in every decision. No work has been done on the cylinder block since the last update. It was returned to Lodi Iron Works just after Labor Day and will be used by them to help address the foundry problems noted in the July 2010 update. Once the problems are addressed, another casting will be made. 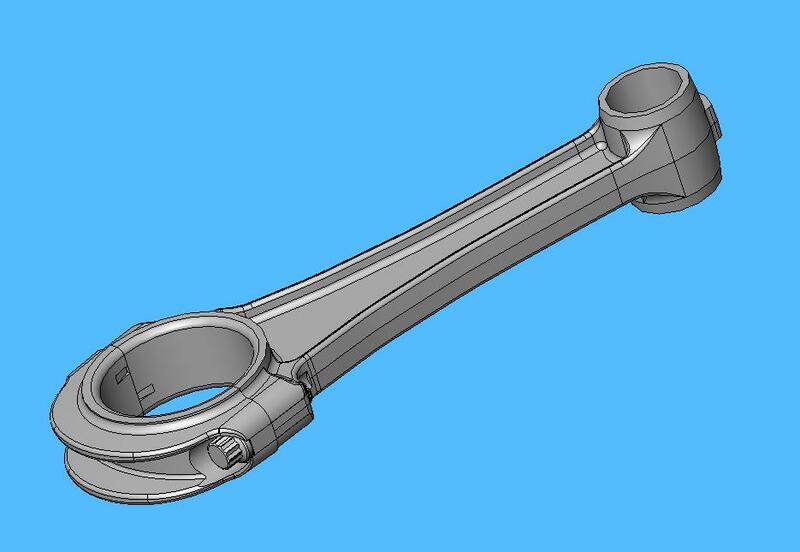 As mentioned in the last update, the connecting rod design was refined. 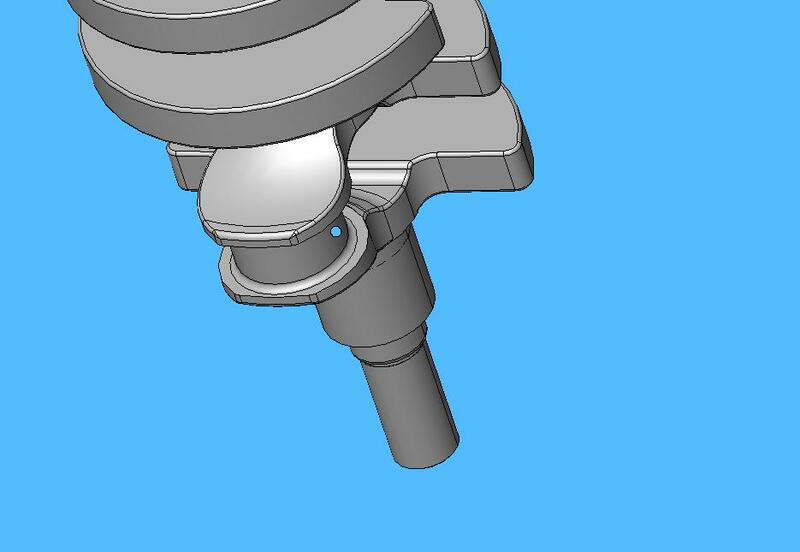 Changes included adding ribs to the cap to make it stiffer, adding a glob of material at the top of the small end that can be partially removed during the balancing operation, and increasing the fillet radii where the small end joins the I-beam section. I’ve also decided to use 2 roll pins to index the cap to the big end of the connecting rod. Other methods of indexing were considered including special studs or bolts with a precise diameter, hollow dowel pins (or drill bushings) around the bolts or studs, and small dowel pins away from the bolts. If anyone has experience or a comment regarding cap indexing, please comment. Bolts chosen are 12 point “off the shelf” (McMaster Carr 91271A641) which have a minimum tensile strength of 170,000 psi. 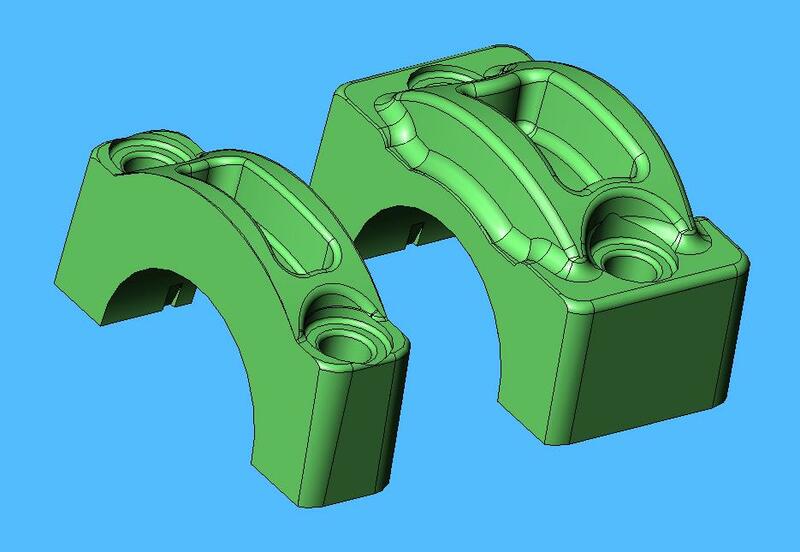 Figures 1 and 2 show the updated connecting rod assembly. The design of the main bearing caps was also refined to add pockets and ribs which results in parts that are stronger and stiffer with a minimum of additional weight. Like the connecting rods, I am planning on using roll pins for main cap indexing. Figure 3 shows one of the wide caps (main #1 & #3) and one of the narrow caps (mains #2 and #4). The rear main cap remains unchanged with the exception of roll pin indexing. As part of the effort to make the new engine affordable, the automated casting line at Lodi Iron Works will be utilized to cast the 4 connecting rods and 5 main caps. This will require aluminum match plates. 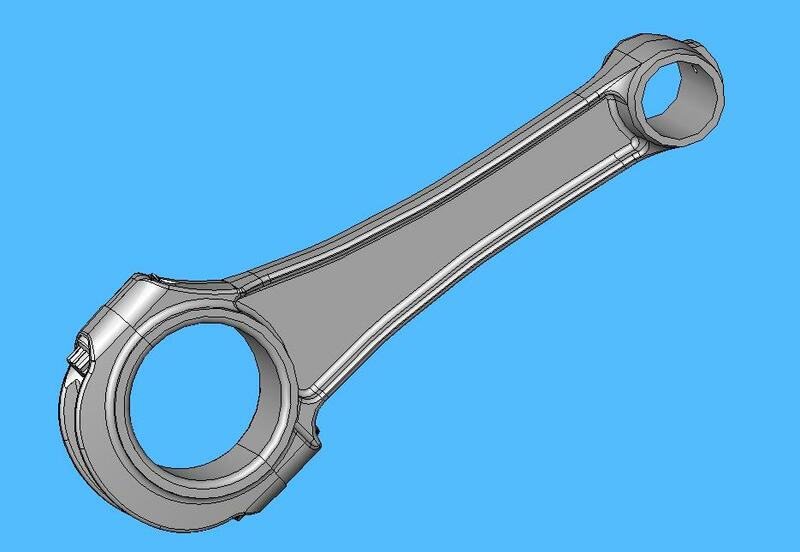 Patterns for the connecting rods and main caps were made with double shrink allowance (aluminum and iron), and have been sent to Lodi Iron Works for arrangement on the match plates. General Foundry in San Leandro will cast the match plates. 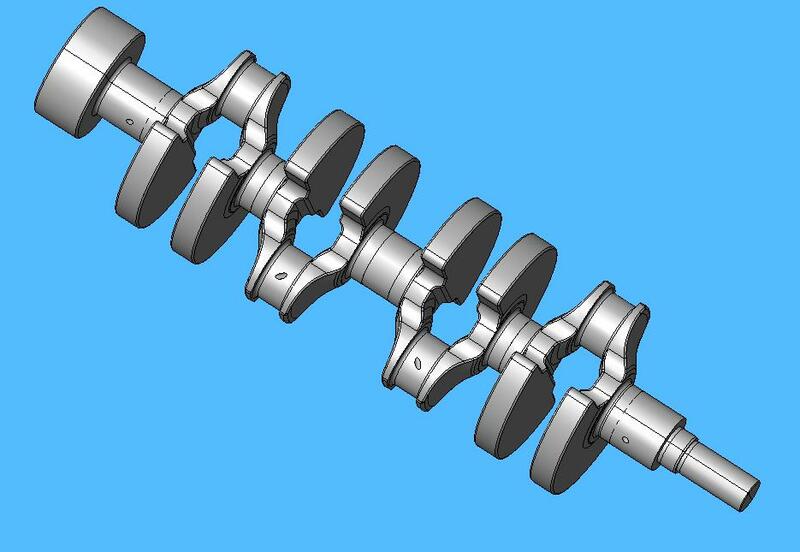 The design of the crankshaft was also refined. Changes include adding draft, removing material from the inner cheeks of the crankpins, and removing some material from the counterweights. Material removed from the counterweights was close to the main bearing centerline axis and had little effect on counteracting connecting rod forces. Oil hole locations were also determined. The locations follow modern practice where the oil hole in the connecting rod journal is at TDC when the connecting rod is on the up-stroke and between 90 and 45 degrees before TDC. This positioning also allows the oil hole to be placed closer to the center of the web, away from fillet radii which would create a stress riser, and away from highly loaded surfaces of the crankpin. 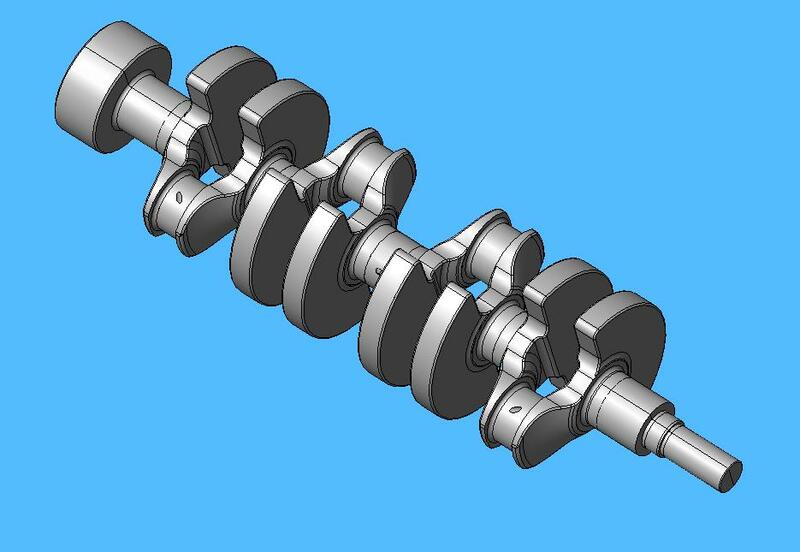 The new crankshaft will weigh 57 pounds. Figures 4 and 5 show the new crankshaft, and Figure 6 is a view looking through one of the oil passage holes. I have nothing new to report. I am waiting for Lodi Iron Works to complete the first useable cylinder block casting and the main cap castings. I will then be able to take the new parts along with an old original cylinder block and my SolidWorks machining model for the new cylinder block to machine shops for real discussions and quotes. I’ll get an update out in Nov 2010.